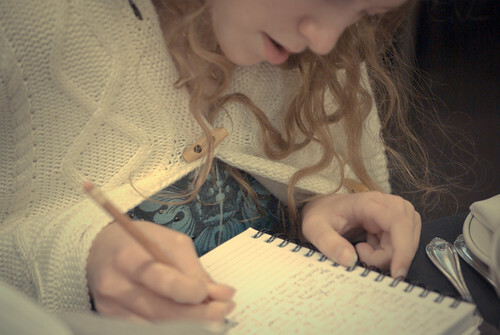 The Writeous Babe Project: Is "Write every day" bad advice? Yesterday my pal Tanya shared a very interesting article with the members of the See Jane Write Facebook group. In this article found on Study Hacks, a website about "decoding the patterns of success," the author argues that "Write every day" is bad advice and uses psychology to support his argument. He suggests that when you resolve to write every day you're setting yourself up for failure. Unless you're a full-time writer, life will get in the way and you will inevitably slip up. And once your plan to write every day fails your motivation for your work-in-progress will be negatively affected and the project you're working on will never get finished. While the argument presented in this article is quite impressive and sound, I still want to write daily. Ironically, it was my exercise regimen that taught me the value of writing daily. On Dec. 19 I resolved to try to exercise for at least 30 minutes a day every day. I kept this up for about three weeks, but last week I slipped up because I got busy with preparing for a See Jane Write event. So this Study Hacks guy is certainly right about that. When we resolve to do something daily we will almost always slip up. But something else happened. By working out daily those few weeks, exercise became an essential part of my everyday life. Those days I didn't exercise my body felt weird, something felt wrong. It was as if I hadn't brushed my teeth or forgot to put on deodorant. And so the slip up did not make me give up on my goal to lose weight and get more fit, it made me more determined. That weird icky feeling I had when I skipped my workout made me want to jump back on the bandwagon, which I did this week. I want to write daily because I want to have the same attitude about my craft, my art. I want writing to be as essential to my day as brushing my teeth. When I’m working on a book, I instead approach each week as its own scheduling challenge. I work with the reality of my life that week to squeeze in as much writing as I can get away with, in the most practical manner. This is what I did with my workouts. Instead of telling myself I would go to this aerobics class on Wednesdays, that weightlifting class on Saturdays, and run 5 miles every other day, I looked at my week and figured out what I could realistically squeeze into each day. Sometimes I played Just Dance on my Wii. Sometimes I lifted free weights at home. Sometimes I ran. And sometimes I went to the gym to a group fitness class. And I think I can use this same method in my quest to write daily, instead of resolving to write for an hour every morning before work (because that ain't happening). And so I still believe "Write every day" is good advice. What about you? I write everyday but I don't necessarily write what I want, as I work as a part-time blogger and run my own blog too. For whatever reason, my brain see this as "work" whereas writing is seen as "not-work." I know this is where my big disconnect is! If my livelihood was running on creatively writing instead of blog writing, I think I would be more likely to do it everyday. I think it's the same as I would never ever run. Period. But if a lion was behind me, I would run until running or the lion killed me.